The Daily GRRR! HEADLINES for Dec. 9, 2014. 1. Ont Premier will ignore climate change impacts of Energy East pipeline. 2. Quebec tar sands resistance gets financial boost from a famous face. 3. Stephen Harper’s economic plan “totally fucked” by falling oil price. 4. Cdns to pay for $136M ‘war chest’ to fund Trans Mountain pipeline. 5. Conservative “critical infrastructure” bill could jail environmental protesters. 6. Haida group animates pipeline opposition with stop-motion music video! 7. Alberta pipeline spills 60,000L of crude oil into grassy bog ecosystem. Welcome back to SoundFM! You are now listening to The Daily GRRR! heard on the airwaves at 100.3fm, CKMS in Waterloo, Ontario, and SoundFM.ca on the web. This is Kathryn and I’ll be your host on this Tuesday morning show for December 9, 2014. 6. Haida group animates pipeline opposition with stop-motion music video! As reported by The Globe and Mail and DeSmog Canada, Ontario and Quebec have decided to mostly ignore climate-change concerns when deciding whether to support Energy East, clearing one the of largest single obstacles out of the way of TransCanada Corp.’s $12-billion pipeline proposal. The move is being hailed by profit-hungry supporters as a major victory for Alberta Premier Jim Prentice, who visited his Ontario and Quebec counterparts this week to promote the project. However, it is already drawing swift and wise condemnation from environmental groups that have warned Energy East would erase much of the recent progress this country has made in fighting global warming ~ not to mention the huge risks to our domestic ecosystems when Energy East inevitably becomes the site of another dangerous oil spill somewhere down the line. This decision comes as a contradiction to both provinces’ previous position. Last month, the two premiers jointly issued a list of seven principles they would use to judge Energy East, one being that the project’s emissions must be taken into account. A motion passed by Quebec’s National Assembly also specified that the government should look at the “global contribution” of Energy East to the worldwide climate change threat. These conditions were understood by many politicians and environmentalists to mean that Ontario and Quebec would consider upstream emissions. But Kathleen Wynne announced Wednesday morning that she will not be considering “upstream” greenhouse-gas emissions ~ that is, the extra carbon released when Alberta jacks up oil sands production to supply the crude for Energy East ~ when deciding whether Ontario will back the pipeline. Quebec’s Philippe Couillard had the same message a day earlier, contending that “it doesn’t add anything to the debate” to consider those emissions. This redefinition of which greenhouse gas emissions will be examined by the two central Canadian provinces is likely to undermine the public consultations on Energy East that are underway in Ontario and Quebec. In both provinces, independent provincial agencies have been tasked with hearing public concerns about the 4,600-kilometre pipeline from Alberta to New Brunswick. However, it would seem that any public concerns about the impact on the climate that would be caused by Energy East and the corresponding expansion of the tar sands may now be considered dangerously moot points. That’s the story as reported by The Toronto Star. But this isn’t really news to those of us in the anti-tar-sands world though, is it? We’ve known for a long, long while how fragile is an economic system built on fossil fuels, and although this isn’t exactly a carbon collapse, it may serve as a bit of a necessary preview to the Conservative government of what things will be like when they can’t rely on dirty diluted bitumen for all their money anymore. When these fees are incurred by Canada-based shippers, they reduce Kinder Morgan's taxes payable. As a result, Allan wrote, "it is Canadians who are helping to finance Kinder Morgan’s expansion plans through foregone tax revenue, not Kinder Morgan’s shareholders, which is the normal course of business practice. ...The NEB has allowed a situation where Kinder Morgan's shareholders bear no risk or cost in advancing its (Trans Mountain expansion) application.” The absurdity and unfairness of this practice is highlighted by comments made by Kinder Morgan Canada President Ian Anderson back in 2013, explaining that even if his company’s Trans Mountain pipeline expansion plans fall through, "all of the development costs are being covered by the firm service fees that we are collecting, so there is no risk to us." As reported by The National Post, according to lawyers who have reviewed the legislation, a private member’s bill backed by the minister of justice that claims to take aim at industrial thieves could, in fact, be used to punish environmental protesters as well. The bill, introduced by Conservative MP Wai Young on Wednesday, would slap harsh penalties on anyone who damages or interferes with so-called “critical infrastructure”. While Bill C-639 was originally intended to beef up fines for anyone caught stealing wire from power facilities, the language in the legislation goes further. It creates a new Criminal Code offence for anyone who damages, destroys, incapacitates, “obstructs, interrupts or interferes with the lawful use, enjoyment or operation” of any critical infrastructure. The mandatory minimum prison terms range from two to 10 years and the fines from $500 to $3,000. The bill defines critical infrastructure as any “publicly or privately owned facility, network, service or asset,” including energy and telecommunication assets, and Ms. Young has commented that “the bar is set quite high,” adding that it could be applied to hackers who take down digital networks. Ms. Young said she introduced the bill at the behest of industry, notably the Canadian Electricity Association and railway companies who’ve recently had a problem with thieves stealing rail spikes. But when Toronto lawyer Ed Prutschi read the bill, his first reaction was: “Is this about pipeline protection?” Mr. Prutschi said the fact that energy infrastructure was included has one obvious purpose: “It would have application for pipeline protests,” he said, noting that the legislation doesn’t require damage to be done — to be convicted, you would just need to be in the way of critical infrastructure. He explained that the bill, had it been in place at the time, could almost certainly have been applied to the recent protests on Burnaby Mountain to block Kinder Morgan’s Trans Mountain pipeline expansion. Coincidentally, or more likely not, Ms. Young’s Vancouver South riding is adjacent to the mountain, and listeners will find no surprise here to know that Canada’s so-called Justice Minister Peter MacKay has also said the bill is consistent with the federal government’s agenda. As reported by the CBC, a new video featuring the music of Kinnie Starr has been making the rounds online, featuring some incredible stop-motion wood-carved characters confronting Prime Minister Stephen Harper, who is depicted on a super tanker travelling around the waters of Haida Gwaii. “Haida Raid 3: Save Our Waters” was released last week in response to the recommended approval of the controversial Enbridge Northern Gateway pipeline project, with resistance to it remaining strong. In the case of this creative action, the video is a collaboration of activism and indigenous culture, produced by the Haidawood Collective, who make stop motion animation featuring Haida culture and language. As stated in the Indiegogo campaign that Haidawood launched, “the people of Haida Gwaii oppose both the controversial Enbridge Northern Gateway Pipeline and the introduction of oil tanker traffic to the northwest coast of Canada.” This is made abundantly and beautifully clear in the music video, which we’ve linked to on the podcast page for today’s show and strongly encourage you to watch and enjoy. The Alberta Energy Regulator has confirmed that close to 60,000 litres of crude oil have recently spilled into muskeg - a type of grassy bog - in the northern part of the province. An incident report states that a mechanical failure was reported on November 27th on a pipeline owned and operated by Canadian Natural Resources Limited. The site of the spill is approximately 27 kilometres north of Red Earth Creek, and although the report says there are no reports of impact to wildlife and that a cleanup has begun, the environmental impacts of such a spill can’t really be known at this point, not least because the oil may continue to migrate south towards Red Earth Creek and risk contaminating that water system. Moreover, a spokesperson for the regulator says officials were delayed from reaching the scene due to poor weather in the days immediately afterwards, which throws into doubt whether their incident report can be given any credence since no one was able to inspect the area before it was made public. This is also not the first spill of this large scale for Canadian Natural Resources Limited. 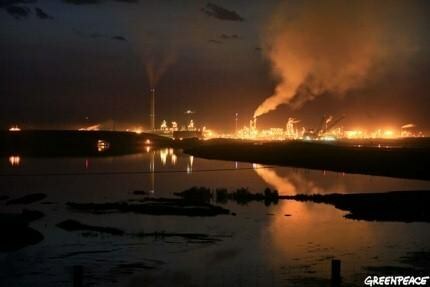 In April, a pipeline owned by the company spilled 70,000 litres of oil and processed water in the Slave Lake region, and we can’t doubt that this trend will continue.